I don’t think it will be any surprise to you to hear that we weren’t the first people knocking at the door of the NEC in Birmingham. If you’ve been reading for a while, you know we’re always late. If you’re new to Sidepodcast, that’s everything you need to know about us. 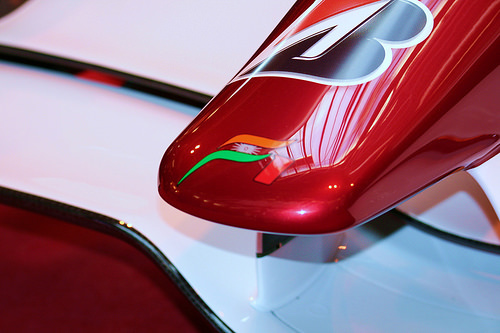 However, we were early relative to our previous form at Autosport International, and we were rewarded by being immediately confronted with the brand new 2008 Force India car. It was sitting all by itself right in front of one of the doors – actually quite conspicuous considering the distance from any other F1 related stands. It was beautiful, as most F1 cars tend to be up close. I was immediately intrigued by the higher cockpit sides, they look out of place and uncomfortable in relation to the rest of the chassis. Of course, if they save an injury or a life, then they’re worth it, and it won’t take long to get used to the new look. The new car proudly displays the Kingfisher logo, which I thought was funny, because on the F1 lineup, they have the 2007 Toyota car, also sponsored by Kingfisher. Double the promotion - clever people, or lucky timing? We toured the arena and were busy familiarising ourselves with the map, when I heard a voice. My radar like ears started circulating the room and determined that Jenson Button was being interviewed on stage. I sped on over there and snapped some pictures. The setup of the stage was bizarre. It was open both sides, so you could be on either, but there was clearly a front. They had a sign language translator standing to one side, doing a brilliant job, and there were more cameras at the front than the back. They did attempt to appease both sides of the audience, but it’s difficult to look two ways at once. Even the interviewer said the dodgy stage setup "wasn’t my idea." Mark Webber was on after Jenson and I was quite surprised at the difference between the two. 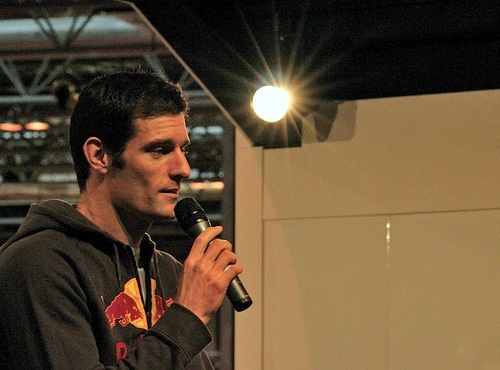 I’d always assumed that Mark Webber was confident and casual and humourous, but seeing them side by side was an eye-opener. Whereas JB was happy to take centre stage – he would be asked one question and talk for at least five minutes on the subject – and was comfortable with his audience, Webber seemed to be a little subdued. Jenson took charge of proceedings, saying he’d rather stand and moving the stools they had been perched on to one side. Mark just sat and talked, gesticulating a little but mostly blinking under the spotlights. This is no criticism on the guy at all, I wouldn’t be happy getting up on stage and talking about myself like that. Especially not three times in a day, the same questions, over and over again. In the audio show I said he was boring, but I don’t think that was a particularly fair comment. Aside from the Formula 1 stuff, there are two main reasons to go to the show – the freebies and the girls. I’m all about the freebies, obviously. It's not all free though. I purchased some proper garage type gloves costing £2, which was a donation and also a bargain. The Kumho girls were doing a bit of promotion, kneeling up on a table with a microphone and asking us to hand over some cash, batting their eyelids all the while. Who can resist? Perhaps I’m all about the girls as well. At another stand, we were accosted by a girl asking if we drove a diesel car and had we ever considered tuning? We answered “yes” and “no”. Cue sales pitch. Whilst between us we could tell you anything you need to know about an F1 car, ask us to discuss a regular road car and it gets slightly embarrassing. You do have to wonder how this woman thought we could answer a question about torque when we could barely identify the make of car we had travelled to the show in. She was polite enough, but I think even she was shocked that she knew more about cars than we did. We shuffled off, heads hanging in shame, determined to do a little more research about our own modes of transportation.